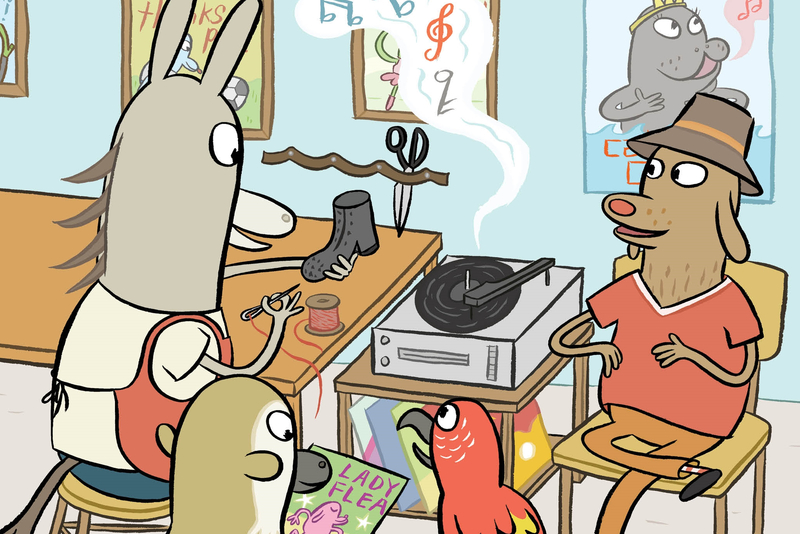 Sara Varon is co-creator, with Cecil Castellucci, of Odd Duck, the 2013 outstanding kids' picture book, and her latest solo venture, New Shoes is a brilliant reprisal of the themes from Odd Duck: camaraderie among eccentric animals, charming small-town life, fascinating technical details, humor, and beautiful, engaging illustrations. "The earliest sawfishes likely arose in the shallow Tethys Sea, that ocean surrounded by the ancient continents of Godwanda and Laurasia, during the Cretaceous period at least 60 million years ago," writes Dr. M. at Deep Sea News. These "sole survivors of an ancient bloodline" now number only seven species which roam the muddy bottoms of coastal areas, bays and estuaries. All sawfishes can move easily between fresh and saltwater and often venture deep upstream into rivers. The sawfish lifestyle puts this both their size and saw near humans. All seven species are considered critically endangered by the IUCN. As much as we have impacted them, sawfish have also greatly influenced our culture. 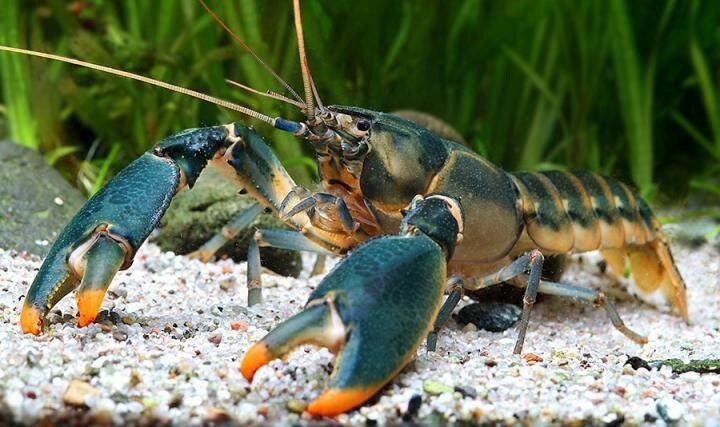 And now, they're one of the most threatened species on our planet. Thanks, humans! Three live cams captured this polar bear family behavior rarely caught on camera. From a public perspective, biology in the oceans, like biology on the land, tends to favor the charismatic megafauna. Stop by your local aquarium and you'll find masses huddled around the seal pool or the shark tank. People will even attempt to interact with the octopodes. Meanwhile, smaller creatures sit on the sidelines. Crabs, starfish, and ray-like skates have some admirers at the touch tanks. But in the world of small things, they're actually quite large. The ocean is full of even tinier organisms—worms and snails, small shelled animals and even stationary colonies of life that look like rocks or lumps of sand. The ocean is an amazing place, and Bill Grossman can tell you about the things that live there—large, small, or tiny. Grossman is specimen collector for the Marine Biological Laboratory. Essentially, he's part of a system of support staff for scientists. When researchers at MBL need sea creatures to study, it's people like Grossman who go out on the water and find them. Sometimes, I get so jealous of British television. Apparently, there's a whole series over there called Inside Nature's Giants. It's basically a zoology dissection show, where scientists break down large, exotic animals in ways that help teach viewers about evolution, biology, and the science of animal locomotion. John Hutchinson is an American zoologist who works as a professor of evolutionary biomechanics in the UK. He's one of the scientists who works behind the scenes on Inside Nature's Giants. He also blogs at What's in John's Freezer?. It's a great title and it gets right to the point: Hutchinson has a job that is centered around the frozen carcasses of all manner of strange (and usually rather large) creatures. His research is all about the evolution and mechanics of motion. He studies living animals, both through dissection and 3D modeling, and he tries to use that data to better understand how extinct animals—including dinosaurs—might have moved around. It's fascinating stuff. And the photos are nigh-on mind blowing. Right now, at John Hutchinson's blog, you can see a collection of shots from dissections and CT scans done for Inside Nature's Giants—including the dissection of an elephant. Here's a diagram that shows the relative size of a great grey owl's body to its feathers. It's hosted on Wikimedia commons, labelled "Cross sectioned taxidermied Great Grey Owl, Strix nebulosa, showing the extent of the body plumage, Zoological Museum, Copenhagen." I dig this because, on verbal description, this sounds rather dull. X-rays of fishes. Great. But when you actually see the images you remember two very important facts: First, fishes have tons of little, teeny bones packed into a relatively small body; Second, fishes come in a wide variety of frequently crazy shapes. 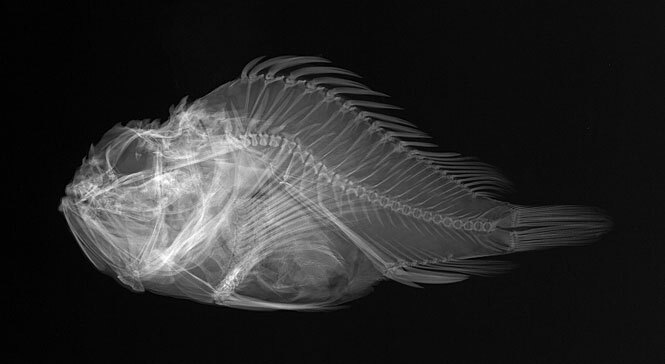 That all adds up to fish x-rays being way more interesting than you might initially guess. Take the scorpionfish. In real life, this family tends to look a bit like a bunch of Muppet trolls—runaway cast members from "Labyrinth" or something. In x-ray, you can see past the wild colors and stubbly, camouflage skin to spot the spines these fish use for delivering a numbing, toxic poison. U xpect adorabulness. U gets it. But kittehs also gives u edukashun n' sientific nuance. That's all the LOLcat speak I can muster in one go. 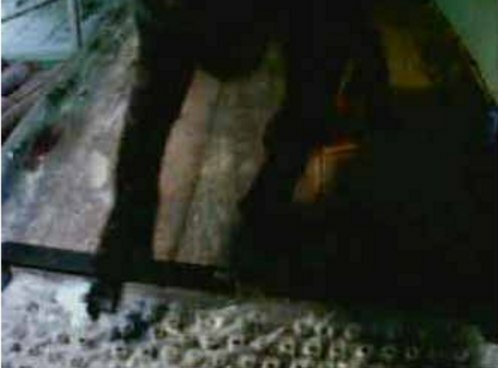 Seriously, watch this video from Big Cat Rescue. It's fascinating. And, you should know, at the end, they link you to a slightly less educational feature about ocelots and lynx chasing laser pointers. Just sayin'.